I have what appears to be that same trigger on a Series 70 that I picked up used. Xavier, you have a lot of really nice pistols, but it is my opinion that this 1991a1 Compact is the coolest one that you own. Thank you for doing a write up on this pistol. A beautiful gun! Pics like these remind me of why I'll probably own a 1911 one day. Reliable as a ball peen hammer. I like that. I have got to start shooting my .45 more. I haven't fired my 1991A1 Commander in more than a year, since it put it in the hidden safe under the floor. I'll have to remedy that soon. Remington Rand Model 1911 .45 ACP manufactured in 1493 and has been re-armored since. 5 inch barrel and fixed sights. plastic checkered grip panels lanyard loop. 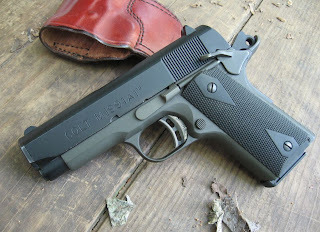 I don't much care for compact 1911's but thats nice work. force blasting down the loaded magazine well. Any ideas on what to do or where to turn? B Johns..... Bad news. You can have the ramp rewelded and recut by a shop such as clarks. The cost will be more than a new frame. You can have a ramp insert placed. Same thing regarding the cost. You can have a ramped barrel installed. This may be the best option, since you would at least benefit from the ramped barrel. Sorry to be the bad news messenger. Xavier, I just purchased a Colt Officers MK IV ser 80. I plan on doing the Clark Reverse Plug and EGW bushing. Thank you for posting all this BTW. How has this system worked out for you any issues or failures to feed. Did you ever consider the single wolf spring? The system has worked very well. Of course, there will always be the question of whether or not the preventitive modification was necessary. I have not tried the Wolff single spring, but with the next spring change, I just might! The possessive of its is "its". The dog wagged its tail. By contrast, "it's" is a contraction, meaning "it is". These are very distracting. Anon, sorry it is so distracting to you. It is a common error of mine. I have to agree with you, the 1991 "compact" is a suprisingly accurate pistol. I got mine used for $399. I was allowed to test fire the gun before buying, the price caught my eye, but the accuracy sold the gun, everyone that shoots it loves it. It's my only compact pistol, all my pistols up 'til then were Govt. models. Very nice gun! 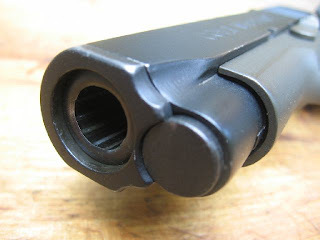 Do most parts for the 1911 models work for the M1991A1? I have one and want to do some similar mods but just don't want to pourhcase the wrong parts. Very nice gun! Do most 1911 parts fit the M1991A1? I have one as well and want to do similar mods but just dont want to order the wrong parts - thanks!! 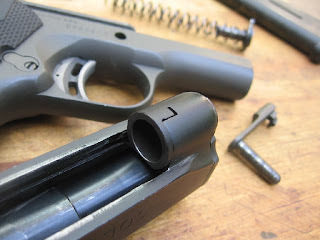 Dude, recently got my gun parkerized (manganese phosphating) but the EGW metl barrel bushing doesn't seem to take on the black fisnih... Any tip on how to solve this (other than "get a new bushing")? Best regards... So nice to see the gun I hold dear (Colt M1991A1 Compact) with its very own web page. Keep the good work up! Best regards.